Small motorcycle initiatives are hard work. 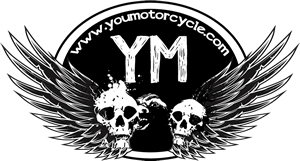 Despite being a hobby, YouMotorcycle and bikerMetric serve up 165,000 page views to over 70,000 motorcyclists every month. The community and friends help out on occasion, but whenever an advertiser steps up and steps in to throw us a few bucks the support goes a long way. The money helps us cover the bills associated with hosting and bandwidth, it lets us buy better plugins or pay for help with programming to make the site experience better for visitors. Thank you to everyone who supports the site, whether you enjoyed a post and shared it on Facebook or Twitter (we love that), letting us know about a typo you found (it happens), or coming on as a sponsor as AMPP did. What’s AMPP anyway? 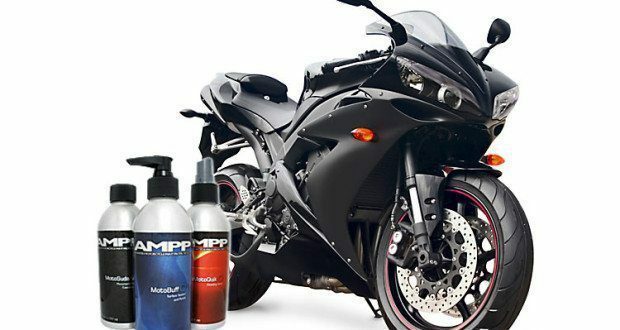 AMPP (Advanced Motorcycle Paint Protection) provides three premium motorcycle care products: a wash, a detailing spray, and a polish. Basically, the trio of shiny metallic bottles they sent me is intended to keep my (or your) motorcycle beautiful. Designed to get the muck off your motorcycle in a formula designed to be both motorcycle-friendly and environmentally-friendly. The Moto Suds formula is nearly pH neutral, meaning the suds are gentle on the finish, wax, and shine of your motorcycle, and won’t dull it or wear it down as much as non-neutral pH formulas would. We also found it cool that the wash mix was biodegradable so you can poor some in a bucket, fill it with water, get cleaning, and not have to feel guilty for pouring the bucket down the sewer. We haven’t tested the Moto Suds yet. It’s below freezing outside and snowing here in Toronto, Canada. We’re waiting on a spring day when it’s time to scrub a layer of parking lot grime off of our sleeping beauties to write a fair and honest review. AMPP’s Surface Sealant and Polish claims to give “brighter whites, rich blacks, and stunning, vibrant colors”, which makes me wonder if I could use it with my laundry, too. The MotoBuff is designed to clear away anything your motorcycle wash missed, seal and coat to protect your bike’s surfaces and any blemishes or imperfections they may have, and polish to drool-worthy shininess. 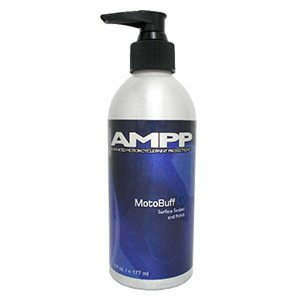 AMPP‘s MotoBuff is said to eliminate the need for waxes and works well with custom paint jobs for all of you fancy-pants motorcycle riders and bikers. What’s cool about the buff is that it can be applied to a variety of surfaces, including motorcycle helmets, and helps to bead away water to keep your visor clear when riding in the rain. I’ll probably test this out soon as my Arai is absolutely filthy from winter motorcycle riding. When I do try it out I’ll link to the review from here. 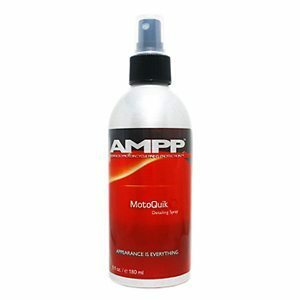 MotoQuik is AMPP‘s answer to keeping your bike silky smooth and sparkly between washes. MotoQuik is a liquid polish you can bring with you on the road if arriving in style is your thing, or simply use it after a long weekend’s ride to spray off and shine up areas of your motorcycle littered in bug guts. MotoQuick is said to work on metals, plastics, glass, rubber tubes and hoses leather and vinyl seats. The idea seems to be that you can use MotoQuik anywhere, and on just about anything – but don’t use it on your tires. As someone who lives in a condo building with no hose or water supply readily available and no traditional garage comforts, liquid polish sprays have always appealed to me. They’re the only motorcycle cleaning product aside from microfiber clothes that I’ve kept in stock since day one, and it’s pretty amazing how much cleaning you can get out of one little spray bottle. Of the three AMPP products sent to me I’m most looking forward to testing out the MotoQuik and writing my report on how it worked. Remember folks, advertisers keep the site alive, fresh, and entertaining. I encourage you all to shop around and enjoy whatever product is best for your motorcycle and your budget. All I ask of readers who enjoy YouMotorcycle is to simply consider purchasing their next motorcycle cleaning product from a motorcycle-oriented business that supports this site. 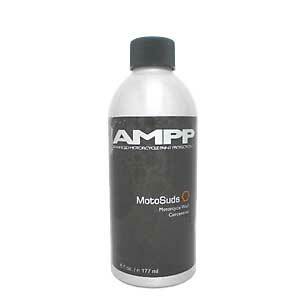 I’ll test out the products in the spring and let you know how they worked, in the mean time you can visit AMPPMoto.com and see if their line up is right for you. Previous: Can You Believe We Actually Won a Contest? !